Home / Products / Seasonal / Summer / Lemon Blueberry Shortbread, 1 lb. Crispy blueberry shortbread cookies surrounded by a zesty lemon fruit confection. 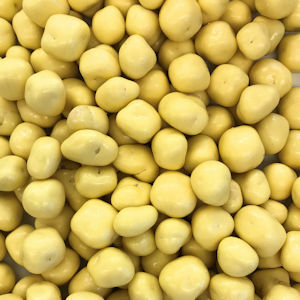 Lemon coating [suagr palm kernel and palm oils, whey, nonfat milk, soy lecithin, vanilla, natural flavor, artificial color 9yellow 5)], shortbread cookies [unbleached white flour, niacin, iron, thiamin, mono-nitrate, riboflavin, folic acid, sugar, butter, eggs, vblueberries, baking powder (sodium acid, pyrophosphate sodium bicarbonate, cornstarch, monocalcium phosphate), natural vanilla extract, salt], sugar, tapioca syrup, tapioca dextrin, confectioner's glaze. Contains wheat, milk, soy & egg. May contain peanuts & tree nuts.